Click here to scroll down to instructions on how to pray the Divine Mercy Chaplet. Before explaining what Divine Mercy is, I should define what is “private revelation.” If you already have an understanding, then don’t click the following link. First, what is “public revelation?” Public revelation is what we know about God through Sacred Scripture and Sacred Tradition through the deposit of faith given by Him. God revealed Himself publicly to the Jewish people, and we know this through reading Scripture in the Old Testament. From the apostles, we know they passed down what Jesus had taught and revealed to them. God’s final, definitive revelation is His Son, Jesus Christ. With that said, the Catholic Church teaches that public revelation ended with the death of the last apostle. 66 “The Christian economy, therefore, since it is the new and definitive Covenant, will never pass away; and no new public revelation is to be expected before the glorious manifestation of our Lord Jesus Christ.” (Dei Verbum 4) Yet even if Revelation is already complete, it has not been made completely explicit; it remains for Christian faith gradually to grasp its full significance over the course of the centuries. Yes, even if God has revealed everything we need to know about Him in Jesus, our understanding is not completely clear. Over the course of time, our understanding grows clearer and clearer. Sort of like going up a river from its mouth where it is muddy and dirty to its source where it is clear. Or like the sunrise that begins to slowly stretch its rosy fingers over the horizon. Sometimes God reveals Himself in a very personal way to us. Or maybe He sends an agent like a saint, an angel, and yes, even His Blessed Mother. In these instances, He reveals something meant for us personally. This type of encounter is a “private revelation” which happens all the time, but some individuals may experience a more profound and blatant encounter of God’s revelation. How are we to understand such things? So in other words, “private revelation” is okay as long as it does not conflict with what has already been revealed and that it helps us live more fully in what has already been revealed by God. How can we be sure that “private revelation” doesn’t conflict with something? The teaching authority of the Catholic Church. Whenever someone makes a seemingly out-of-ordinary claim through “private revelation,” the Church will investigate to make sure that it isn’t heretical or contradictory to what we already know through the deposit of faith. And since the Church has been around since Jesus, who better to keep track of the deposit of faith than she? The other thing I should highlight about “private revelation” is if it is Church-approved, then we, the faithful, should make attempts to gain deeper understandings of what was revealed. However, if a “private revelation” is not Church-approved, then we are not required or encouraged to pursue it. With all that said (if you read it), that leads me to Divine Mercy. Essentially, Jesus gave us a clearer understanding of His infinite and divine mercy through private revelations given to a Polish religious sister named St. Maria Faustina Kowalska. Who is St. Maria Faustina Kowalska? Her original name is Helena, and she was born into a poor, peasant family in Glogowiec, Poland. She was the third oldest of ten children, and “from childhood she distinguished herself by her piety, love of prayer, industriousness and obedience as well as by her great sensitivity to human misery” (Diary, xv). At the age of seven, she started feeling the call to religious life. Her parents were not keen on letting her join a convent, and she tried repressing her desire to join a convent. But from a vision of the suffering Jesus, she strengthened her resolve to join a convent. She ended up in the Congregation of Sisters of Our Lady of Mercy in Warsaw. 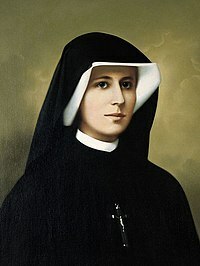 There, she received the name Sister Maria Faustina. She completed her novitiate (basically, the novitiate is the newb stage to religious life) and professed her perpetual vows of poverty, chastity, and obedience after five years of being in the convent. She worked in various houses for the Congregation in different locations in Poland, especially as cook, gardener, and doorkeeper. I’m a fan of that last sentence. She willed to align her will to that of God’s will. As she grew older, she started having health problems. And sometimes she experienced a profound spiritual suffering known as the “dark night” where a soul doesn’t receive any consolation from God as if He has abandoned the soul. She grew very sick and eventually died in 1938 at the age of 33. Because of the life she led, her personal piety and obedience to God’s will, and passionately serving as a conduit to God’s message of mercy, she was canonized as a saint by Blessed Pope John Paul II in April 2000. How was Divine Mercy revealed? She kept a diary, which is out in publication. Apparently Jesus revealed to her that she should keep one. I started reading it a while ago, but haven’t yet finished it. In it, she shares her daily struggles with religious life and life in general, but most intriguingly she wrote down what Jesus said to her whenever He appeared. It’s almost conversational, as if St. Faustina was really talking to and listening to someone. Or rather…Someone. Through these private revelations, it is clear that Jesus was with her throughout her life, especially during her times of suffering. Though He spoke to her a lot, I want to focus on His message of Divine Mercy. 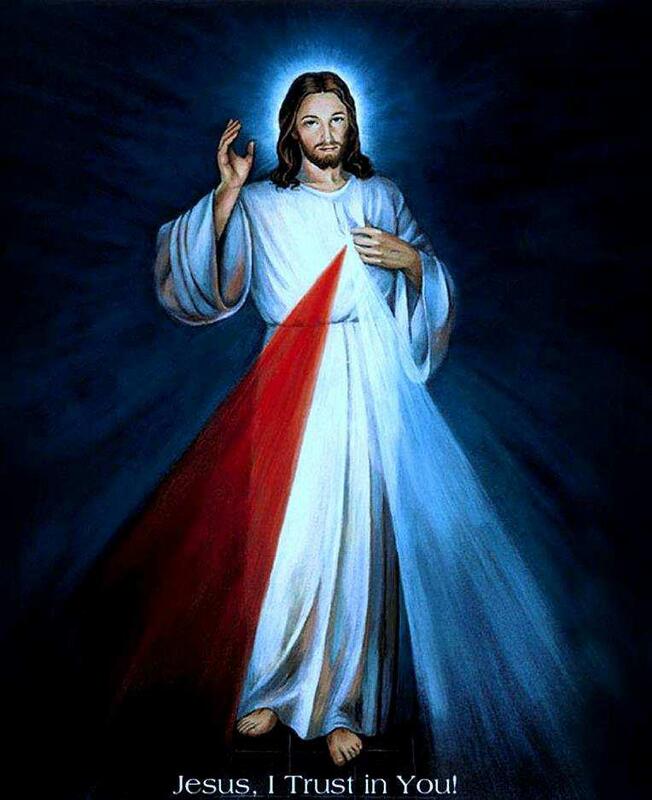 The Divine Mercy Image (seen at the top of this post), which is a painting of a vision St. Faustina had of Jesus. The elements of the image has special meanings. 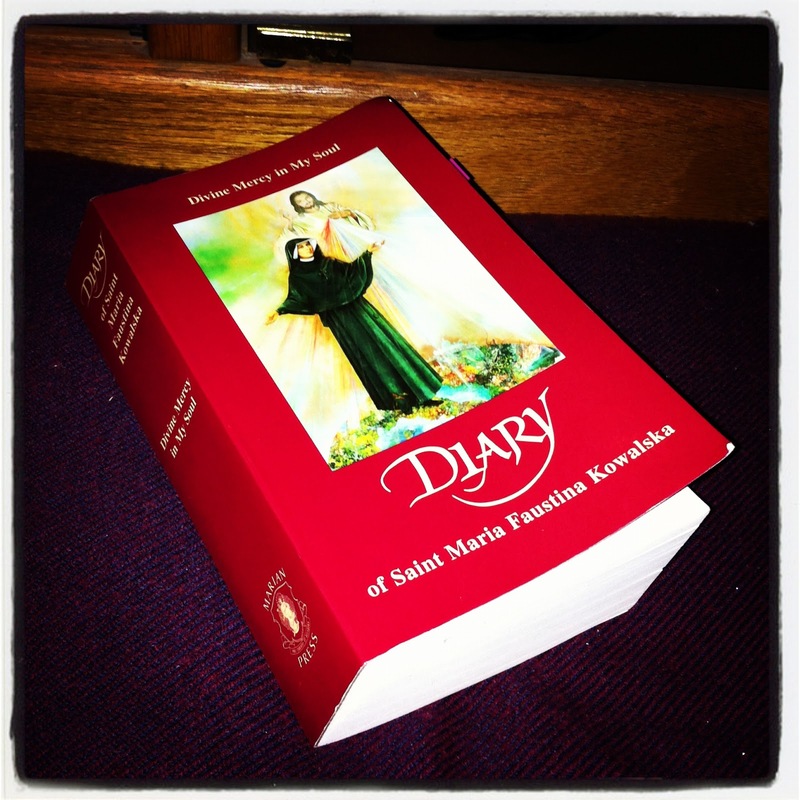 More info about each can be found in the intro of her diary by Sr. M Elizabeth Siepak or at DivineMercy.org. Why Divine Mercy matters to me? I was first introduced to Divine Mercy in high school, particularly through the Chaplet of Divine Mercy. 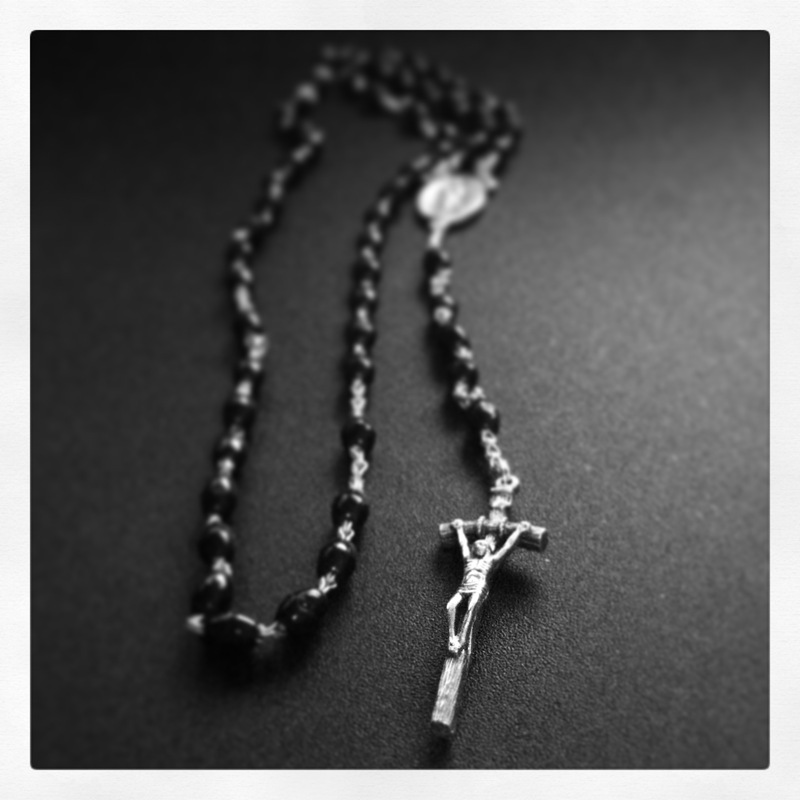 For me, the Chaplet prayerfully reminds me of Jesus’ Passion and death. I face my own forms of internal and external sufferings, and praying the Chaplet reminds me of His mercy, which strengthens me to endure those sufferings. But, as selfish as that seems, the other benefit of having a devotion to Divine Mercy is for me to gain a better understanding of what is God’s mercy. Once I begin to understand and know His Divine Mercy, I can be better able to show mercy to others. Is that important? Why yes, because showing mercy to others is an act of love. Like, back in high school…we often offered the Chaplet of Divine Mercy for all involved in abortions. For the parents, the doctors, the clinic workers, and for our country. Through these petitions for Divine Mercy, we hope and pray that there is a change of heart and an act of mercy carried out in choosing life for the unborn child. Our prayers for all involved in abortion is an act of mercy…out of love. In college…umm…yeah, I didn’t really develop my appreciation and devotion to Divine Mercy. God had me focused on other devotions, it seemed. However, now that I’m involved with my parish and through that involvement, I’ve developed a deeper appreciation for Divine Mercy. And it is easier in this setting because we have made it a weekly habit to pray the Chaplet once a week. I realized when interacting with members of my parish that everyone, too, has their personal struggles and grasp for the hope in God’s infinite mercy. Perhaps that is why praying the Chaplet has become a very attractive thing for us to do and without fail, there is a good handful of us who pray it once week. Lastly, I’m writing this blog post at the conclusion of a really crazy week in terms of human suffering here in the United States. Monday was when the Boston Marathon bombings occurred, and in the middle of the week was the West, TX fertilizer plant explosion. Found out today that the manhunt for one of the suspects in the Boston bombing was captured last night. All of this is happening, and I can’t help but think about Divine Mercy and its necessity in dealing with all of this. Again, through a deeper understanding of Divine Mercy, I can begin to better show mercy to others…not on my own, but with God’s help. I hope that the idea of mercy is not lost as we go through these days following the two major events this week. My favorite way to be devoted to Divine Mercy is through praying the Chaplet. I usually pray it on the way home from work on Fridays, and as a reminder I set myself a public post of one of the lines of the prayer on Facebook and Twitter. It’s cool because sometimes people complete the line and keep going. And then, as has been our tradition in my volunteer work at my parish, we pray the Chaplet after class on Sundays. (Repeat 3x) O Blood and Water, which gushed forth from the Heart of Jesus as a fountain of Mercy for us, I trust in You! Eternal Father, I offer you the Body and Blood, Soul, and Divinity, of Your Dearly Beloved Son, Our Lord, Jesus Christ, in atonement for our sins and those of the whole world. Nowadays, I’ve been praying it using a particular sung version, and I’ve even learned it on my ukulele. I was originally taught the chanted way of praying it, but eventually I learned this really cool sung version of it by my high school youth minister’s band. You can listen and/or follow along here: Remnant Band – Chaplet of Divine Mercy. And a recent trend for me is to go back to the chanted version I learned back in high school. All cool ways to pray the Chaplet since it can be recited, chanted, or even sung. Kowalska, St. Maria Faustina. Diary. Stockbridge, MA: Marian Press, 1987. Print.